Machine Learning: What is it? How does it work? How reliable is it? In this program, Chris Lynde and Mike Griffiths of dbSIgnals explain the basics and the promise of machine learning for everyday marketers. Machine learning is not new, but it's application in B2B marketing is increasing because of the availability and variety of large data sets, computational processing that is inexpensive/powerful, and affordable data storage. 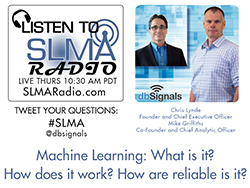 dbSignals CEO Chris Lynde and Co-Founder Mike Griffiths discuss what it means for the marketer to make decisions in real time from the constantly learning capability of machine learning. Case studies will be discussed. Let's catch you up: Machine learning is a sub-field of computer science that evolved from the study of pattern recognition and computational learning theory in artificial intelligence. Machine learning explores the construction and study of algorithms that can learn from and make predictions on data. Chris is CEO and Founder of dbSignals, a leading provider of cloud-based marketing automation software. dbSignals enables organizations to engage in successful lead generation and relationship marketing with a single interface that targets very narrowly defined "custom" audiences across multiple channels. dbSignals integrates massive amounts of prospecting data, online click through data, and customer data with a software package that enables highly targeted and relevant messaging using machine learning and state of the art analytics. Mr. Lynde has over 30 years' experience working with large scale data and database marketing companies including Equifax, Experian, and EDS's Direct Marketing division - Neodata. Mike Griffiths is an accomplished database, online advertising and analytics expert, who helped pioneer the field of online behavioral targeting and optimization. Mike was a founder and CTO of Matchlogic, one of the original online advertising companies, and the first company to create and use behavioral targeting in an online context. Prior to MatchLogic, Mike designed and developed systems in such diverse fields as Machine Learning, GIS, Computational Geometry, Simulation, Knowledge engineering and Computer Language development. Mike was a pioneer in the field of online privacy. He was one of the founding members of the Network Advertising Alliance (NAI), and went on to represent the advertising industry during congressional hearings in 2000. Mike holds multiple patents in the fields of online advertising, media delivery, and laser printing optimization. dbSignals is ranked among the top marketing automation solutions for large, medium and small businesses by Raab Associates' 2015 Vendor Selection Tool (VEST) Report. The company combines data, technology, and the science of machine learning to automate the sales and marketing process so customers can stay focused on running their businesses. dbSignals' Customer Acquisition Prospecting Databases, coupled with real-time data management and self-learning technology creates smarter campaigns and the best results possible. The dbSignals platform sits on top of an integrated database that contains customer data, a national B2B and B2C prospecting database, and a complete system of record.